My son was totally into collecting box tops when he was in elementary school. His enthusiasm has kind of died-off, but I have a little plan to help get him re-engaged…I made a DIY Monster Box Top Collector Craft. Tell me he isn’t going to want to collect box tops and deliver them to school in this, now. Heh. Do you realize how awesome the Box Top program is? I didn’t, at first. My son was all like “mom, don’t throw those away!” And I kind of smirked at him. But, at his insistence, I read-up on it. Did you know that each box top is worth .10 cents? Ten cents that they can use on things they need–and they need a lot of things. LOL! That ten cents adds-up really quick. Especially considering that there are TONS of products that carry the box top symbol. Seriously, so many of the Reynolds Consumer Products participate in box tops, the list is too long to include here. Needless to say, Hefty and Reynolds products are on our “target” list for picking-up at the store…just so we can get those box tops to the school. LOL! 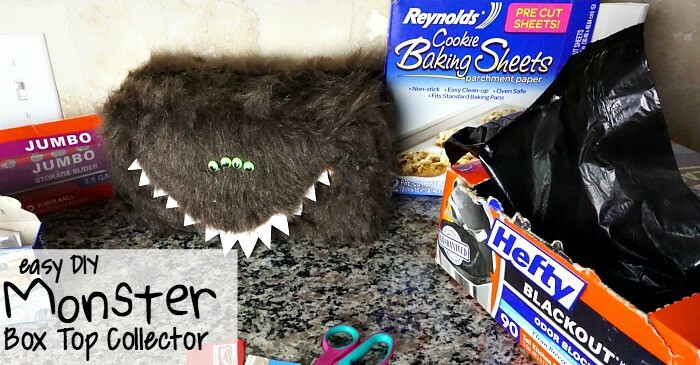 Plug-in your hot glue gun. While that’s heating, trace the opening of your Hefty Trash Bag box onto the sheet of paper. Draw teeth along the outside edge of the opening-tracing. Give yourself a “border” on the inside edge of the opening-tracing to make sure you don’t cut off too much and make it difficult to glue your teeth to your box later. Cut the teeth out of the sheet of paper. 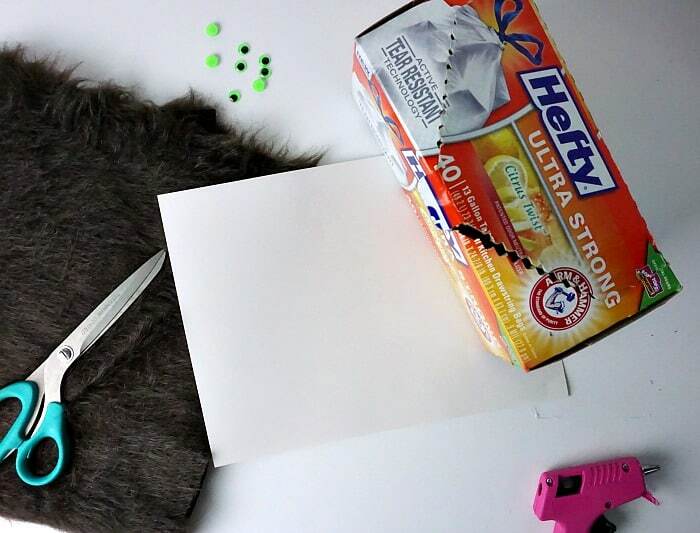 Using your box as a guide, cut out a portion of the fake fur that will cover the box completely. Ok, your hot glue gun should be hot by now, so, using it carefully (it’s hot), place some glue on one side of the box, then apply the fake fur to the glue, making sure your edges are straight-ish. Continue to glue fake fur to each side of the box, covering it like you would a present. Even the side with the opening. Trust me. This is the easiest way to go about this. Using your finger to gently probe, find the opening on the box, then, using your very sharp scissors, carefully puncture a hole in the fake fur. Using the hole you just punctured, cut along the box’s opening. With the hot glue, affix the teeth to the inside of the box. Glue the appropriate number of eyes onto the top of the box. 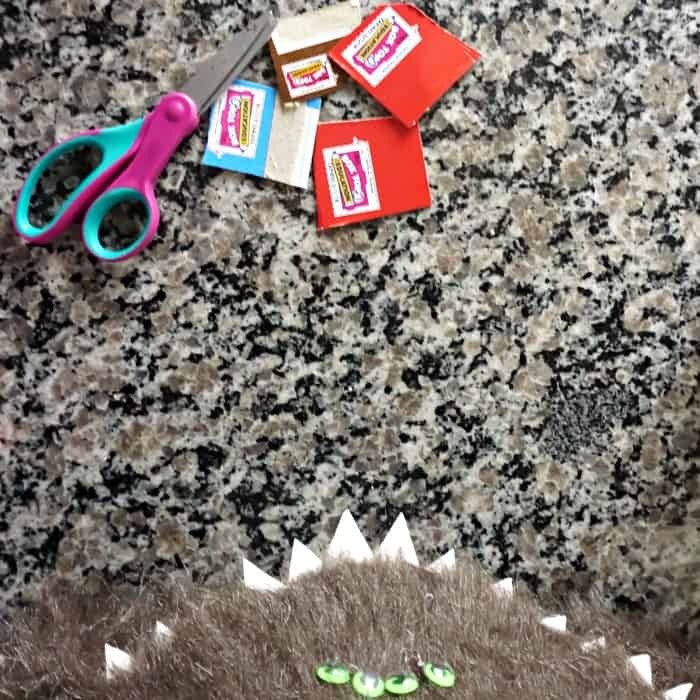 Start feeding your monster box tops! 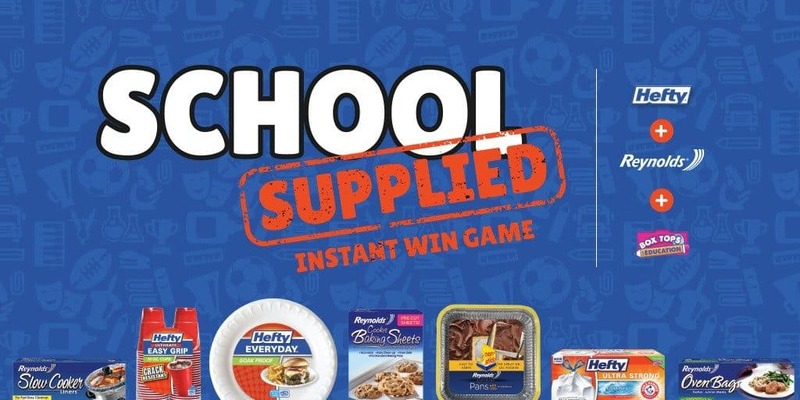 You can get ready for school by participating in the Hefty and Reynolds Box Tops for Education “School Supplied” sweepstakes and daily instant win game! They’re giving away thousands (yes, thousands) of product prizes PLUS 10,000 eBoxTops to 5 lucky schools!! 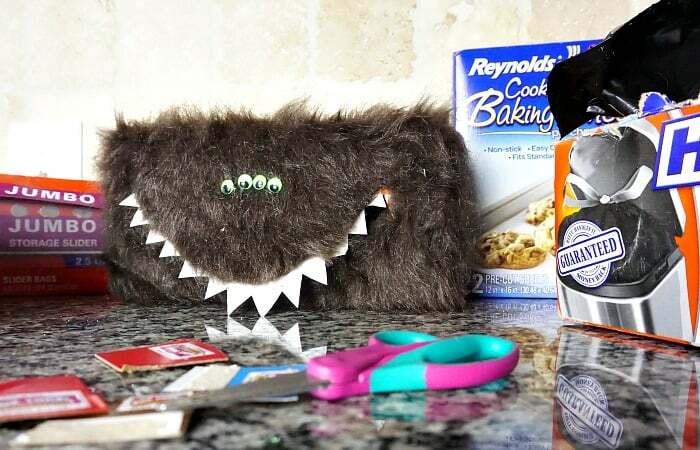 So, now that you’ve entered, finish-up getting ready for the school year by making your own DIY Monster Box Top Collector Craft. And send me a picture on Facebook to let me know how it turned out! Don’t have time to make it right this second–pin it for later so you can come back to it! LOL!